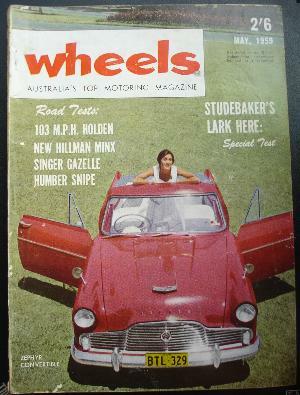 This magazine is titled -WHEELS, Australia's Top Motoring Magazine, dated May 1959. Cover Pic - a red Zephyr Convertible. Road tests - 103 M.P.H Holden Station Sedan (modified road model by Lou Kingsley, the New Hillman Minx, The Singer Gazelle, the Humber Snipe & The Studebaker Lark. Other items - Car manufacturing in aust, the first Cadillac in Sydney, 2 new secret VW models (a smaller beetle?) and much more. Black & white except for the cover. COND: Cover has wear on edges and the spine is missing the "title"(leaving the binding visible). Mag - Corners & edges bumped, some corners creased, but nice overall. Last updated 8th July 2010.